Comments: General Maximillian Veers is a stern military man who is determined to do his part in the dismantling of the Rebel Alliance. Following Darth Vader's orders to destroy the Rebel shield and power generators at their secret base, Veers clears the way for Vader's landing on the ice planet Hoth. 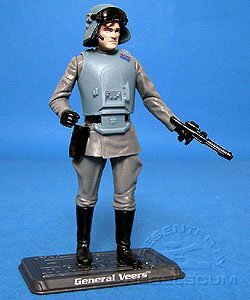 General Veers commanded Blizzard Force, ground forces consisting of AT-ATs, AT-STs, and a legion of Imperial Snowtroopers. The Battle of Hoth is the only battle onscreen the Imperial actually won.